Range Rover Chassis number 26 is the first of the batch of the 20 Press Cars built for the launch of the Range Rover to the Worlds press in Cornwall June 1970. Bought by us as a complete but unrestored project it has been the subject of a complete meticulous restoration. NXC231H retains many of its original pre production features such as Aluminium Bonnet and Bendix Servo. Featured in the new book by Land Rover engineers Geof Miller and Roger Crathorne, " The First Fifty" which chronicles the development, manufacture and post-Land Rover life of the 50 early Range Rovers so well known to collectors. NXC231H remained with Land Rover after the launch before being sold in 1973. We have traced much of the history of chassis 26 before it came into our ownership in 2000. This is a true collector car and one of only a handful with superb historical provenance, this Range Rover will prove to be a good investment over the years to come. Due for completion during September. 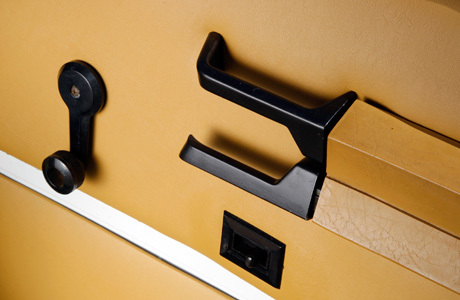 A hallmark of a Honychurch restored Range Rover is attention to detail. Andrew has an eye for the small things and in spite of the rarity of hard to find original specification parts Honychurch has a large stock of parts for restoration projects. If it cannot be found then it is usually made. First the Range Rover is stripped down totally to every last nut and bolt and then the chassis and body are fully repaired using our own facilities. Spot welding as well as MIG ensures an accurate rendition of this Iconic vehicle. After the body and chassis has been repaired it is blast cleaned and coated. All mud and water traps are fully waxoiled and prepared so a Honychurch Range Rover will last at least another 40 years. A full prefit is undertaken before the vehicle is painted. The cars can be built to exacting stock specification or enhanced and improved with the addition of leather trim, power steering on early cars, and more driver orientated performance packages. As well as a number of early cars for restoration Honychurch also has a stock of the last of the Classics, the four door Vogues. Classic Range Rovers are now firmly established as true collectors vehicles and with such versatility, what better way to go shooting, fishing or towing your classic race car than in a beautiful period Range Rover restored by Honychurch. 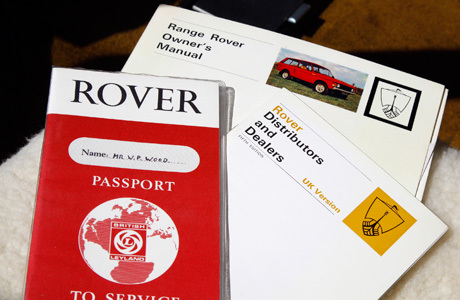 Andrew Honychurch has been involved with Range Rovers since the early 1970s. 40 years of experience leads Honychurch to have in depth knowledge of the exact specification and details of a proper restoration. Many early Range Rovers have been updated in service with later compatable, but incorrect parts. Honychurch aims to restore these cars to an accurate ex Factory specification. A restoration is not a restoration unless it correct. We are actively pursuing the remanufacture of original trim, rubbers, body panels to name a few of the hard to source parts. Direct contact with those Land Rover employees involved in development, engineering and launch on the original Range Rover in 1970 along with studying production details leads us to have a knowledge second to none. We are also restoring chassis number 26, a pre production press launch car which illustrates many pre production details such as an all aluminium bonnet not taken into production. The now famous “kitkat” style vacuum formed plastic seats were not successful in service and as well being somewhat uncomfortable they also broke up due to early plastics technology not being fully developed. Never the less the early seats “look the part” and in our view make a car correct. We can provide beautiful sheepskin tailor made seat covers which not only hide unsightly cracks in the plastic, but make the seating more confortable and are very period.